In 1983 Patrick Khumalo, out gathering firewood for his mother, sees his entire village in rural Zimbabwe massacred. A family of white Rhodesian settlers take him in and raise him as their own. Twenty-nine years later he sends an urgent message to their daughter Constance, once his playmate and now a classical violinist living in Austria. On the other side of the world, in Washington, DC, Joshua Denham is at an Austrian Embassy function to see his cousin Constance perform. As the first note is struck, the woman who’s haunted his thoughts for the past year—a private banker he last saw in Kyrgyzstan—sits down at the end of his row. New possibilities fill his mind . . . but Devon isn’t quite what she seems. Constance is acting strangely, too. Her abrupt disappearance is followed by a desperate call from her estranged father Roger, begging for Joshua’s help: Constance is in deep trouble. Joshua, Devon, and Roger must track her down to an abandoned farmhouse in Zimbabwe’s Lupane District, and to an explosive reckoning with the ghosts of the Rhodesian Bush War. 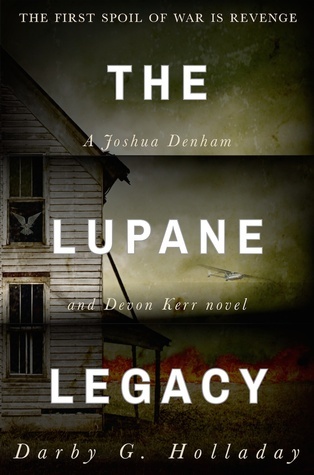 The Lupane Legacy is a story of tangled family ties, of the long shadow of history, of revenge, betrayal, and redemption, and of two people finding a new beginning. This story is set in 2012 but a good part of it revolves around events that took place in 1983. It includes a lot of political schemes and scandals, which are quite hard to digest for a non-political reader like myself, but surprisingly I liked it a lot. I was engrossed in reading right from the start to end. It has a fair amount of twists and turns that keeps the reader guessing. The pace of the story is subtle if not slow and it served well given the complexity of some elements. As this is the first part in the series, it featured the beginning of Joshua and Devon’s relationship. And the way I see it, they have a long way ahead of them. Devon’s investigating behaviour was quite weird from the start and frankly I just can’t understand how such a learned and smart guy like Joshua didn’t see it that way! Well, this is all the romance one can see in The Lupane Legacy. The writing is very simple and engrossing. I really, really liked it because it made a fairly complex plot quite understandable for a person like me, who knows nothing about American- African history. Most of the concepts were explained well, except for some teeny-tiny loopholes. But as this book will have a sequel that is totally understandable, as long as they get cleared up in the next part. I would define the beginning as very subtle. It was perfect given the seriousness of the plot. It gives a fair idea of what’sto be expected from the rest of the book. The seriousness that you can see in the cover art goes perfectly with the theme of the book. The blurb is Spot-On! Explains the book perfectly and also tells a great deal about the characters. Highlights: Simple yet effective writing and a great plot. Final Thoughts: A fairly good read! Next Post Attention! Reviewer Wanted! Hmm. I think I’ll pass on this. Great review though Heena! Wow- sounds like an interesting read! I have a tough time with politics, but it seems like the authors voice keep things moving along and interesting. Thanks for sharing! Sounds great! I think it’s a good idea to read outside your chosen genre. You never know what will inspire the muse! Always like a story mix with politics and scandals..thanks for the review, I think I am going to read this book soon!